Home → Events → Fun Friday! We welcome all incoming CSHS Orchestra kids to come out on Friday night to hang out in the orchestra hall! This should be a great way to get to know everyone outside of school hours. Movie of choice will be played, and we will designate rooms for playing games or plain out socializing. 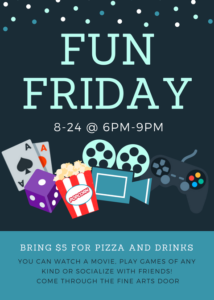 Bring $5 for pizza and a drink.